This guide shows you how to persist player information across game sessions using PlayFab. It uses the Unity starter project as a base. PlayFab is a backend platform which allows you to authenticate players, store custom player data and perform other player management features. In most SpatialOS games, every player is represented as an entity. This allows you to store player information in components during the player’s session. However, when the player leaves the game, the player’s entity is usually deleted along with all of the information stored in the entity’s components. In order to keep information about the player for the next time they login, you need to save this data somewhere outside of the entity. One method is to use a third party service such as PlayFab. PlayFab lets you read and write data about a player in a key-value store. In the example in this guide, each player has an outfit. This can be changed by the player and is seen by other players in the game. The outfit selected by a player must persist even when they log out and log back in. 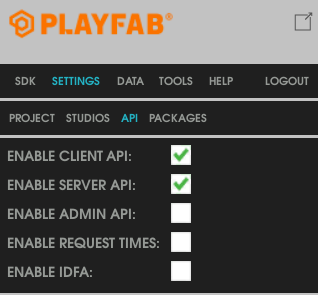 PlayFab provides a Client API and a Server API. The Client API is used for authenticating the player with PlayFab, and reading data about the player. The Server API has full authority over all the players, and it can be used to modify the data for any player. This means that in SpatialOS, the player can log in to PlayFab from the client worker, and then the Server API can be used by the managed workers to send updates about players. Install the PlayFab Unity Editor Extensions and the PlayFab Unity SDK by following the PlayFab Unity Getting Started guide up to the “Making your first API Call” section. To use the Server API, PlayFab requires the developer secret key. So you don’t need to recompile if the secret key changes, you pass the secret key as a command line argument. This also allows you to only give the secret key to the UnityWorkers and not the UnityClients. This is essential to prevent a player hacking a client and retrieving the secret key. Open workers/unity/spatialos.UnityWorker.worker.json. The command-line arguments for each target are defined in the arguments object. In Bootstrap.cs, at the beginning of the Start() method, extract the secret key from the command line arguments and set the value in the PlayFabSettings class. Add the following import statements. The Server API uses the PlayFabId to identify players. You can keep the PlayFabId in a component on the player entity. The UnityWorkers can then use this when they are sending updates to PlayFab. Each login request on the Client API returns the PlayFabId. A simple implementation could be for the UnityClient to send over the PlayFabId to the UnityWorker and then it can be added into the player component when the player entity is created. The problem is, the UnityClient could be hacked, and then a different PlayFabId could be sent to the server, effectively allowing someone to login as a different player. To solve this, you can use the SessionTicket which is also in the result of a PlayFab login request. You send the session ticket to the UnityWorker when the client is requesting a player entity. 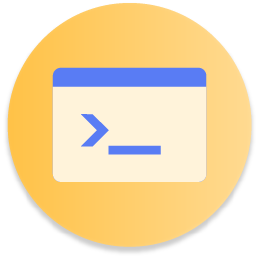 The UnityWorker can then use the Server API endpoint AuthenticateSessionTicket to authenticate this ticket and get the player’s PlayFabId back in the response. You can then save the PlayFabId in the player’s component when the player entity is created. PlayFab provides multiple ways for a player to log in to PlayFab using the Client API. The documentation for these login requests can be found here. Once the player has logged in, you can download the initial player data. This ensures that the player entity is spawned with the up-to-date data from PlayFab, instead of downloading the data after the player is spawned. Enable the script by attaching it to the GameEntry game object in the UnityClient. Currently, UnityClient is connecting to SpatialOS as soon as the scene loads. This connection happens in the Start() method of Bootstrap.cs. In Bootstrap.cs, add a field to store the CreatePlayerRequest object which will be sent with the CreatePlayer command. This starts the client’s connection to SpatialOS after the client has logged in and got the initial player data. Once you have retrieved the session ticket and the player data, you need to send these to the PlayerCreator to verify the session token, and if successful create the player entity. In the StarterProject, the player entity is spawned by a command being sent to the PlayerCreator entity from Bootstrap.cs. This command is then received in PlayerCreatingBehaviour.cs on the UnityWorker side, where the player entity is then created. See Client connection lifecycle for more details. When the PlayerCreator recieves the CreatePlayer command, it is now given a PlayFab session ticket as well as the initial player data. To make requests to PlayFab from the managed workers, a player’s PlayFabId is needed. The session ticket can be used to verify the player’s login and retrieve their PlayFabId. 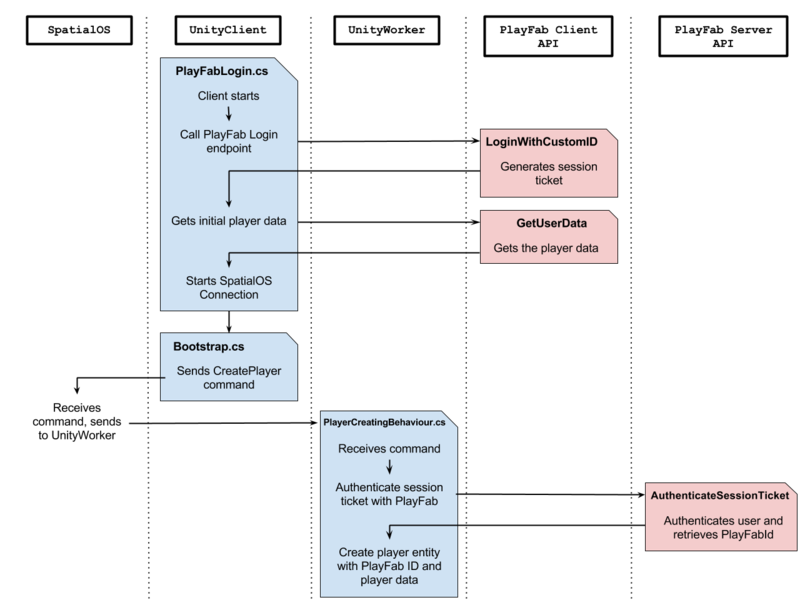 This method uses the AuthenticateSessionTicket endpoint of the PlayFab Server API to verify the session ticket and get the player’s PlayFabId. Making an HTTP request during the handling of the CreatePlayer command will increase the time it takes for the command to respond. You may need to increase the timeout of the CreatePlayer command to allow for this. The timeout is an optional parameter in the SpatialOS.Commands.SendCommand method. In order to identify players when the UnityWorkers make Server API requests, they need to know the player’s PlayFabId. To achieve this, you can keep the PlayFabId in a component. You can also add a component to store the player data, in this case the outfit. This component can be updated during the game, and the updates can be sent to PlayFab. 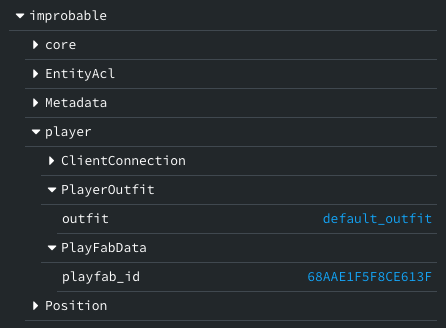 PlayFabData.schema: holds the player’s PlayFabId, which can be used by the UnityWorkers when they make requests to the PlayFab Server API. PlayerOutfit.schema: hold the player’s outfit id, which can be used by the client to render the correct player outfits. It is important to not make the client authoritative over the PlayFabId. You don’t want to give the client the ability to play as another person! Now you have a PlayFabId kept in a player component, you can make any updates to a player by including the PlayFabId in the Server API calls from the UnityWorkers. It’s up to you when to send player updates to PlayFab. 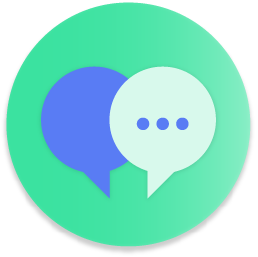 You could send an update to PlayFab every time a component value which you are synchronising with PlayFab changes. 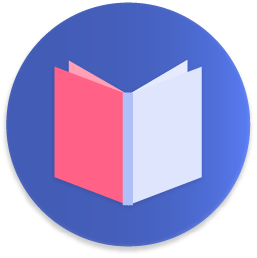 The benefit of this method is that PlayFab is kept as up-to-date with the component value as it can be, as it receives an update as soon as the value changes. Add a method OutfitUpdated() as a callback for when the player outfit changes. This method uses the Server API to update the player data with the new outfit. 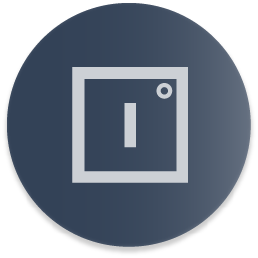 The player is identified by the PlayFabId stored in the PlayFabData component you made earlier. Now add this script to the player prefab, build all of the entity prefabs and build all of the workers. Any changes to the outfit component will now be saved to PlayFab. The next time the player starts the game, their player entity will contain the outfit value that they set in the previous game session. The above method of updating PlayFab on every component change would not be suitable for a value that frequently changes, as every change triggers an HTTP request to PlayFab. This could overload the worker, or possibly cause a rate limit to be set by PlayFab. If you expect the component value could change frequently, you may consider rate limiting the updates to PlayFab yourself. Alternatively, you could just send one update when the client disconnects. You would need to be careful here that the player disconnecting logic is always run. For example, if a deployment is stopped, the player disconnection logic would not be run, and PlayFab may not be updated correctly.